Deluxe Retractable Banner Stand 24 " : Set up quick and easy. Banner attaches by Velcro. Clean edge to edge display. Graphic size: 24"W x 85" to 92"H (with a 6" bleed on bottom). TRAVEL BAG INCLUDED (29” x 12" x 4"). Graphics turnaround 3-5 business days after the day proofs are approved. (Turn around times based on orders with up to 10 banners. ) For more quantities please call us to get estimated turnaround time. 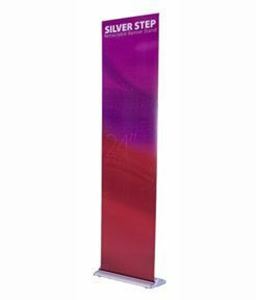 Dowload PDF Template Silver Step Retractable Banner Stand 24"